Raiffeisen e-banking - simple, fast and safe! Raiffeisen PhotoTAN is an innovative security tool for login and transaction signing in Raiffeisen e-banking. It can be used instead of the security card or SMS-TAN. Raiffeisen e-banking customers can enable PhotoTAN within e-banking ("Einstellungen > Sicherheit > Login"). Instructions can also be found there. In this method Raiffeisen e-banking encodes the login and transaction data in a colored mosaic. The mosaic is then photographed from the screen using the built-in camera in your smartphone. The data contained in the mosaic and the associated signing code will be decoded by this app on your phone, and displayed. 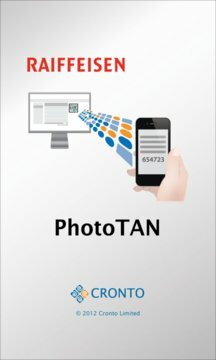 Due to the unique activation of the PhotoTAN app with a personal key, the mosaic on screen can be decrypted only by the smartphone. 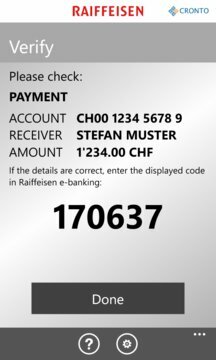 If you are using Raiffeisen Mobile Banking, the PhotoTAN app installed on the same device reads the code in the background, and returns it automatically to the Mobile Banking app. For this method your smartphone requires no Internet or phone connection. We point out that, by downloading, installing and using this application a third party (such as Microsoft) may infer an existing, former or future client relationship between you and Raiffeisen. By downloading this app, you expressly agree that the information you provide to Microsoft data collected in accordance with their terms, transferred, processed and can be made available. The terms and conditions of Microsoft, which you agree to be distinguished from the legal notice of Raiffeisen.